CIMBA takes team building to the next level by using special processes, technology, and personal coaching to relate the team building activities back to the business environment. The CIMBA team building activities use a series of challenges where individuals must work together to overcome obstacles. Through these challenges, you learn to communicate better, build trust in one another, and have a fun, shared experience. During the obstacles, CIMBA emphasizes specific and proven processes in problem solving and decision making. The teams have a chance to practice the skillsets together and develop common language and guidelines which are especially reinforced if they have already taken the Kepner-Tregoe PSDM course. CIMBA uses a tool developed by MIT called a Sociometer™ which allows teams to see and review the social dynamics that occurred during the decision making and problem solving process, including the percentage of turns each person takes, talk time versus silent time of each member, and the number of interruptions each person makes both successfully and unsuccessfully. This data allows you and your team to become aware of your dynamics and, during debriefing sessions, to address what can be done to improve team member engagement. Furthermore, CIMBA utilizes a process where teams identify real business goals and explore together the barriers to success. This begins the process of understanding the underlying reason those barriers exist so the team can begin exploring solutions to potentially deep cultural and behavioral issues that are preventing progress. 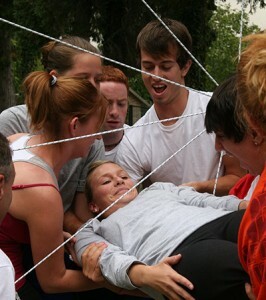 CIMBA’s team building activities are much more than a fun experience for people who work together. The experience ends up solidifying some common language and guidelines for problem solving and decision making, provides actionable data on team dynamics, and sets up a process for understanding and going beyond behavioral barriers toward progress on business targets. When the training ends, teams have a plan in place to execute and maximize the application of what they learned.